the geordie times online (newcastle united archive fanzine): "WE'LL DRINK A DRINK A DRINK TO LILLY THE PINK THE PINK THE PINK!" "WE'LL DRINK A DRINK A DRINK TO LILLY THE PINK THE PINK THE PINK!" 'The Geordie Times' haz just receeeved ecluuusive pix of wor new 'cup' 3rd(4th?) 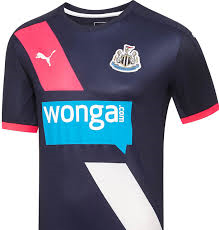 strip for the forecomin' season!---A natty PINK and black number which shud be popular with wor female fans for sure! Ne release date for the new strip haz been annoonced but we will keep yoo posted when we find oot! "STONE ME!----IT'S A 'CARVE UP'!" "FOR A FEW DOLLAR$ MORE!" SPECULATION FOR THE GEORDIE NATION! "FUNNY SHAPED BALLS IN 'THE STRAWBERRY'!"